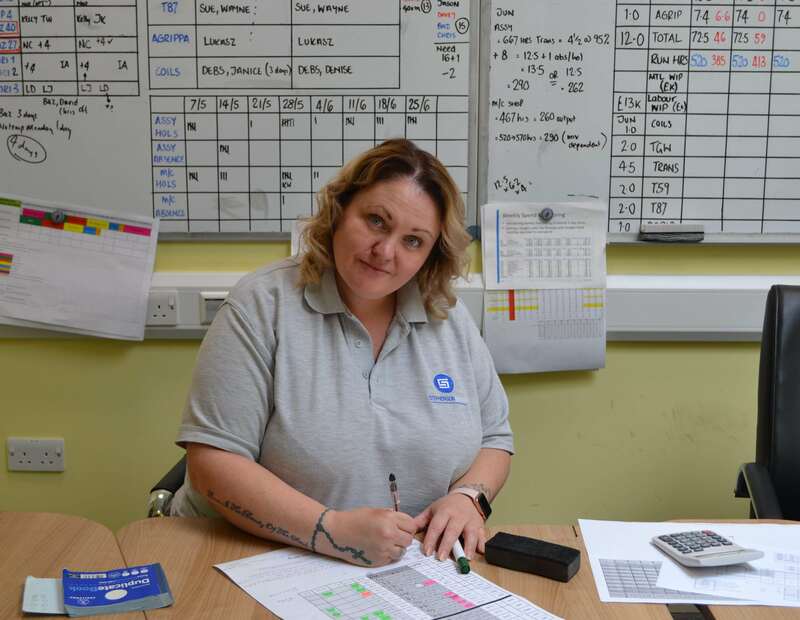 Interviewing Karen Lyons, a Production Supervisor at Stephenson Gobin, makes it easy to see why those that she manages trust her and find her so easy to talk to. She’s energetic, warm and friendly, and the first thing she talks about is how much she genuinely loves her job. And it’s evident, from how passionately and earnestly she says it, just how sincere she is about that fact. Karen began her career as a Call Centre Manager, where she stayed for 14 years, and later joined Stephenson Gobin in telesales. She remained in telesales for three years, until she was offered her role as Production Supervisor. Since adopting the role back in 2014 Karen frequently demonstrates how keen she is to raise the bar for herself through learning new skills and developing new processes within the business. Not only that, but as a supervisor, she is always looking for new ways to help encourage those on her team to raise the bar too. In one sentence what is a Production Supervisor? A Production Supervisor is responsible for communicating job expectations, implementing new and concise processes and planning. As well as monitoring, appraising, coaching and guiding staff. How did you become a Production Supervisor? It wasn’t ever something I expected to do. I’d always worked in an office environment but the CEO recognised that I wasn’t fulfilled in my telesales role, so he offered me this opportunity. Although I didn’t have much experience in the factory, I had lots of transferrable skills including managing people and good product knowledge. I’m really grateful that I was offered the opportunity, because I genuinely love my job. Stephenson Gobin comprises of SG Transmission and Geofire. SG Transmission designs and manufactures electromagnetic clutches and brakes; Geofire manufactures a wide range of electromagnetic activation devices, ranging from fire door holders and closers to smoke curtain releasers. I’m responsible for overseeing and managing all those on the shop floor from the engineers, to those on the production line, to the packaging and delivery of the product to the customer. What’s the most exciting element of your job? Definitely nurturing and developing people and seeing them progress into more rounded and confident employees. I enjoy building confidence. To do that I give them lots of praise and reassurance about how well they’re doing. Recently, one of the women that I supervise was working on just the one line of production because that’s where she felt comfortable. We decided to upskill her and started to train her on a new line dealing with Geofire’s Agrippa product. Now she’s one of the quickest on that line! She calls me ‘her daughter’ because we’ve worked together so closely and I’ve been helping to train and develop her from the beginning. She feels she can trust me and she’s able to talk to me about anything. That’s incredibly rewarding. I also enjoy facing the new challenges that each day brings and having something to get my teeth into. I’m challenged every day. This role was something completely new to me after working in the call centre and in telesales. I’m constantly raising the bar for myself, letting myself do things that I’ve never done before and learn things that I never thought I would. Every day is new and exciting. Are there any other challenges associated with your role? When I first started four years ago, it was a challenge to build the trust and respect that I needed in order to succeed in my role. I’d come from a very female heavy environment in the offices, to a male dominated shop floor. Because I was coming from an office background, and with no technical knowledge, I had to work hard to shape new relationships on the shop floor. I don’t know how much of that might have had something to do with the fact that I was a woman coming down to work amongst all these men. I’ve noticed that I am often treated differently to my male counterpart, but in a positive way. I think I’m more respected. I get more people coming to me if they have an issue, because they know that I will take action and sort the matter. I think that’s because of my personality more than down to the fact that I’m female and so supposedly a more nurturing gender. They trust me on a personal level and on a work level. This job’s a huge challenge for me, personally. I’m totally out of my comfort zone. It was such a big change after so many years in the call centre and telesales. Having the technical knowledge of the machines etc is always a huge challenge too. But, because I’m always learning, I’m certainly never bored! I come to work because I love my job though, and even if I’ve been having my own problems outside of work, I always make sure to come in bright and cheerful because it makes others feel better. It’s nice to be told you’ve been missed if you’ve been off too; it makes you feel wanted and appreciated. As Production Supervisor how do you support your engineers? I listen to them and not just as a supervisor, but as a friend. You have to show compassion and that you’re willing to do something to try and help them. They’ll come to you a lot more if they trust you. At the end of the day though, it all comes down to the individual. How do you encourage other women in engineering to raise the bar? On the shop floor we have six male cell leaders, and one female cell leader. She doesn’t have a lot of confidence and when I first approached her about the position, she didn’t want to do it because she didn’t think she was capable and was worried about doing the courses. I worked very closely with her, giving her guidance and reassuring her that she was more than capable. To help with her confidence, I arranged to go through the courses with her, even though I’d done them already. That gave her the courage to speak up, do her group work and complete her coursework, because we were doing it together. She’s now received all of her qualifications and is a strong cell leader! Wow, you certainly seem to go the extra mile and you’re constantly raising the bar for yourself and the others around you. What improvements have you introduced? I do try to go that extra step and I try to be there as much as possible. I’ve worked to upskill a lot of staff, for example I’ve worked with people to get them from working in assembly to the machine shop so that they can run basic CNC functions. I’ve also worked hard to improve the shop floor culture, and I’ve tried to build a community. People want to come to work because they enjoy it and not because they have to. The culture’s a lot more friendly and open now. There’s no longer such a divide between those in the factory and those in the office. For example, we have a Cake Club and a Pie Club, but it’s not just for those in the office. Those from the shop floor come up on a Monday to take part, bringing their cakes and pies in to be tried and tested. It’s a little bit of healthy competition and it helps to build relationships where there weren’t any previously. I’ve seen a massive improvement in the last few years and I think that’s because now, there’s somebody available to talk to who will listen. I’ve been in this role for four years and when I look back, a lot has been done and it feels great to be a part of it. Are you interested in a career working within a global engineering company? Take a look at our current vacancies.